The understandable fear of getting hurt when falling on ice is borne out of first hand or vicarious accounts. So many of these falls occur when the ice is not seen, when hands are full carrying something, when descending a stairway, or when we are preoccupied and not paying attention – in short, when we are not anticipating or prepared for falling. And we are probably not wearing footwear appropriate for icy conditions and are certainly not wearing protective gear. 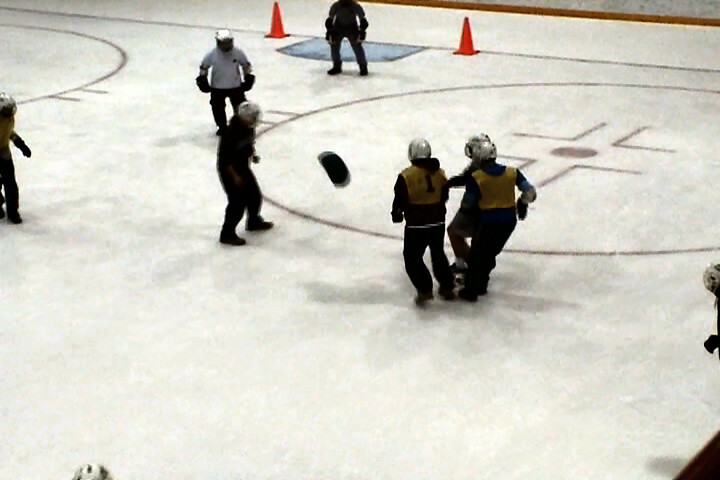 ICE SOCCER risks should not be gauged by these types of falls. To put sports falls in perspective, look no further than competitive figure skating — hard falls without any protective gear. A fall on hard–packed turf after a slide tackle or an aerobatic kick in field soccer is no less dangerous than a fall on ice, and field soccer players do not have the gear to protect elbows, hips, knees or head. Skate–boarding falls give another view — onto concrete and off railings — very often without anything more than a helmet, if that. We also have horseback riding falls, skiing falls, cheerleading, falls, gymnastic falls and bicycling falls. American football falls, roller derby falls, ice hockey falls, and rugby falls (all of which combine falling and hitting) add an even clearer perspective on falls — falls that are intrinsically part of these sports. If we try to eliminate falls, we eliminate a tremendous number of sports. 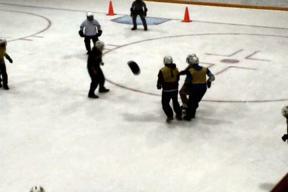 Further, most on–ice falls in ICE SOCCER dissipate the energy over a long ice surface, minimizing the impact. These falls are not like falls on ice where you strike a sharp object on the way down and are unlike the immediate, sudden slam–stopping into turf or boards or concrete of certain other sports mentioned above. In June 2005 James Hartnett, President of the Ice Skating Institute — Dallas, Texas — a trade organization representing over 1200 ice arenas, was at the conference where ICE SOCCER was first introduced to the public. After hearing the presentation about ICE SOCCER and seeing a video of beta–play at Colgate University, Mr. Hartnett remarked in an after–meeting mix session that he considered ICE SOCCER as far less risky, specifically, than either broomball (sticks/flying balls) or ice hockey (hard hitting, sticks and 80–100 MPH pucks); and less risky than many other sports. To offer or play ICE SOCCER, or any sport, is a personal, family, institutional and/or community decision.